Summary: A young woman tries to save three people she loves in this elegant and remarkably insightful coming-of-age debut. When I read the description for AN UNCOMMON EDUCATION by Elizabeth Percer, I had a feeling that it was going to be a book that I'd enjoy. I love female coming-of-age stories (Heck, who am I kidding? I love all types of coming-of-age stories! ), and I especially enjoy novels that take place at schools. I most definitely wasn't wrong in assuming that I'd like this novel. I found the story and characters development to be a very strong and I thought the writing was outstanding. AN UNCOMMON EDUCATION tells the story of Naomi, a young girl who sadly has to face losing those people closest to her. First, her only friend Teddy unexpectedly disappears from her life. Then, her father dies of a heart condition. And finally, Naomi "loses" her mother to depression. Because Naomi is determined to "save" her loved ones, she decides to dedicate her life to becoming a heart doctor and sets her sights on attending Wellesley College. She is accepted into Wellesley; however, she discovers that she is still an outsider and has a hard time making any real friends. One day, Naomi witnesses a girl fall into lake in the middle of winter and her life begins to open up. She is accepted into a secret Shakespeare Society, and she truly begins to blossom. She becomes involved in theatrical productions, but, more importantly, she begins developing some friendships. Naomi finally seems to have found some happiness, and she almost was able to forget the tragedies from her childhood until a big scandal occurs at Wellesley that involves her best friend. Naomi is determined to help her and, once again, trying to save those she loves. Throughout the course of AN UNCOMMON EDUCATION, Naomi matures and begins to realize the before she can fix everyone else's problems, she must first save herself. I thoroughly enjoyed AN UNCOMMON EDUCATION. I found the character of Naomi to be extremely complex and I was fascinated by what made her tick. The book spent a lot of time in Naomi's childhood setting up the events that made Naomi into the young woman she eventually became; and while I appreciated learning about her family and youth, I have to admit that I was a bit surprised by how much of the book centered around this time. I guess I was expecting more of the story to take place while Naomi was at Wellesley gaining her "uncommon education." This isn't a complaint about the novel -- just a small surprise to me. While I did appreciate learning Naomi's background, I must say that the book really took off for me once Naomi left for Wellesley and discovered the people in the Shakespeare Society. I loved seeing how Naomi began discovering not only the world around her, but herself as well; and it was refreshing to see her belong to a group of people and even develop some special relationships. I very much appreciated seeing Naomi's growth as a woman and her ability to truly understand herself and those around her. I hesitate to even mention this, but for much of the novel, I felt as if a major part of the childhood portion of her story was just dropped. (I know that sounds vague, but I don't want to give away any spoilers!) At some point, like Naomi, I think I was able to almost "move on" from her childhood experiences while she was away at Wellesley; however, part of me still wondered what happened (probably just like Naomi!) By the end of the novel, that storyline and character did reappear (in a rather surprising way); and I was very grateful for the way everything was wrapped up. I ended up being very satisfied with how the book ended as well as the life lessons that Naomi learned as a result of this closure -- it definitely worked for me. I found a lot of things in AN UNCOMMON EDUCATION to be very impressive, but nothing more so than Ms. Percer's writing. Ms. Percer has been nominated for the Pushcart Prize three times so it shouldn't have come as a surprise that she is a skilled writer; however, I do admit that I was surprised to learn that this is her first novel. I thought she did an outstanding job with the character development and I loved so many of her descriptions. Plus, the prose truly was beautiful. I appreciated how she brought the settings to life, especially Wellesley College; and she effectively incorporated many recurring symbols and themes into the story. 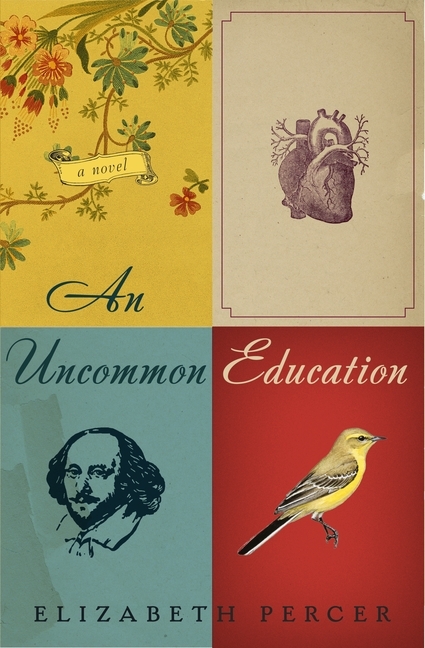 AN UNCOMMON EDUCATION would make a fantastic book club pick for groups who enjoy literary fiction. There is a reading guide available with ten interesting questions. The book has some fascinating characters as well as some universal themes about human nature so there is a great deal to discuss. Some of the topics you might want to explore include mother/daughter relationships, mental illness, honor, friendships, education, trust, and discovering one's self. I thought AN UNCOMMON EDUCATION was a wonderful (and thought-provoking) read. Highly recommended. I love coming of age stories too and this sounds like a great one! I can't wait to read it! Sounds like an interesting read. Thanks for the review. I would have been very disappointed if the character and story line was not revisited. This review has me so curious! I passed up the opportunity to review this one, but I'm glad you really liked it. And I might still pick it up at the library. Great review! This looks very interesting. Quite a concept.